The small and powerful DJI Takyon Z650 is made for racing. A custom designed System on Chip (SOC) and a modular design combine with efficient and intelligent motor control algorithms to make the Takyon Z650 an extraordinarily fast and ultra-accurate motor control system. The Z650 supports 3-6S 9.6 - 26.1 V batteries with a maximum working current of 50 A, ensuring powerful propulsion. Just 1/4 the size of other ESCs with the same working current, the Z650 is perfect for a compact aircraft. 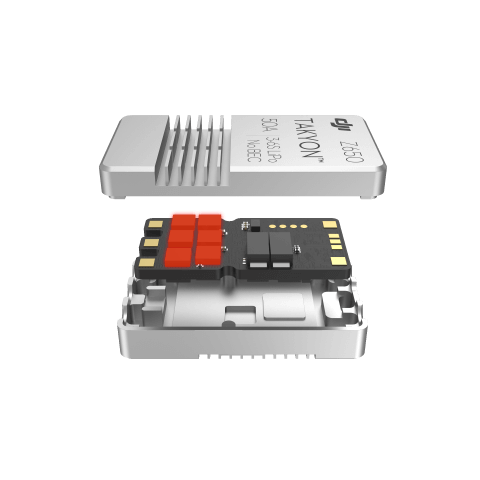 The integration of high-performance components, new internal circuitry and optimized heat dissipation, gives the Takyon Z650 a smaller size, higher performance and better reliability. 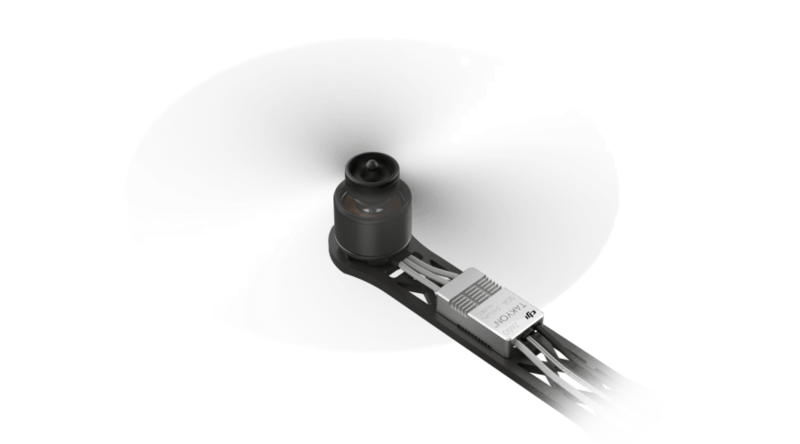 Advanced heat dissipation technologies developed for the Takyon Z650 allow for higher performance even with a compact body where heat-generating components sit close. The Z650 uses low impedance components and replaces the Standard PQFN Package with the Dual CoolTM Package, increasing the thermal conductivity to the outer shell up to 10 times. The aluminium alloy shell further enhances the heat dissipation to allow for high powered aircraft to operate steadily for up to a whole day. Takyon Z650 thoroughly optimizes the effort-efficiency, increasing the power efficiency by 44%-59% and enabling longer flight time. 3D Mode affords Takyon Z650 instantaneous motor direction changes, enabling complex maneuvers that would otherwise be impossible. The power recyclable function provides longer flight times and higher flexibility. Takyon Z650 will slow down the motor and recycle power when receiving deceleration commands, providing excellent dynamic response and increasing energy efficiency. 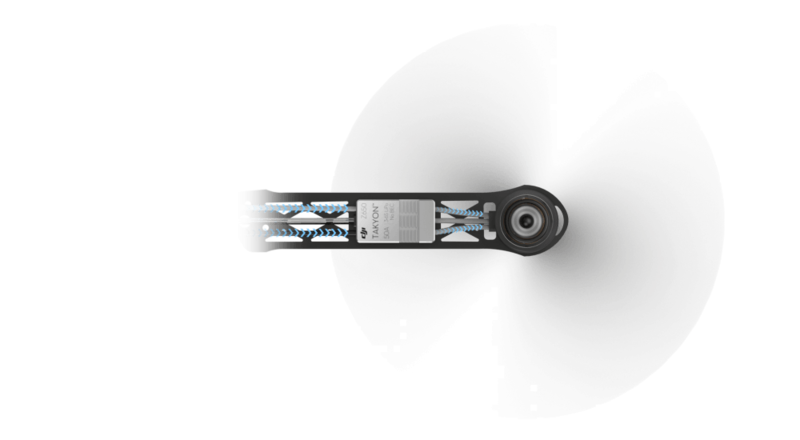 Integrated locked-rotor protection prevents damage to motors in the event of a locked or blocked rotor. Takyon series ESCs constantly scan connected motors in real-time and will cut power if motors stall due to a locked rotor, protecting the propulsion system from avoidable damage. Takyon series ESCs can be used on a wide range of square wave drive brushless motors including High KV motors without manual tuning through flux observation and self-adaptive control technologies. Takyon series ESCs support high-speed throttle signals at frequencies up to 500Hz and OneShot125 for fast throttle responses. A custom designed 32-bit DJI motor drive SOC integrates a power management system, main control and driving system, giving Takyon series ESCs smaller dimensions but higher performance. The Z650 can support PWM of up to 48KHz and comes with a crystal oscillator for accurate control and quick responses without additional throttle range calibration. The included DJI Assistant 2 simplifies the process of customizing how an aircraft flies. Set acceleration, timing, active braking, and throttle range according to each situation, or tune an aircraft for racing, quickly and easily. DJI Assistant 2 can also be used for firmware updates, which bring new features and upgraded compatibility. *Takyon ESC Updater is required for parameter settings and firmware updates.